As the parliament in Westminster continues its descent into anarchy you could be forgiven for thinking that British politics has reached a state of such utter dysfunction that it may never recover. Thank God then for Scotland which - in an increasingly lunatic world - looks like it will emerge from the morass of Brexit with its dignity intact. There is no denying that those most aggressively seeking Scottish independence have seized on Brexit as a powerful propaganda weapon to advance their cause. While that is certainly true, it does a disservice to Nicola Sturgeon and her administration to suggest that advancing Scottish independence is the only reason that they have so vigorously fought to stop Brexit. Though a majority of Scots voted against independence in 2014, when it came to the Brexit vote in 2016 the vast majority of Scottish voters - 62 per cent - said they wanted to stay in the EU. Now as the UK prepares to drive off a cliff, in the most demented act of political self harm witnessed in Europe for decades, our Scottish neighbours are pleading with Europe not to abandon them in their hour of need. Debate in Westminster has become a tragic farce but in Europe sense, logic and responsibility have generally prevailed in the face of British irrationality. 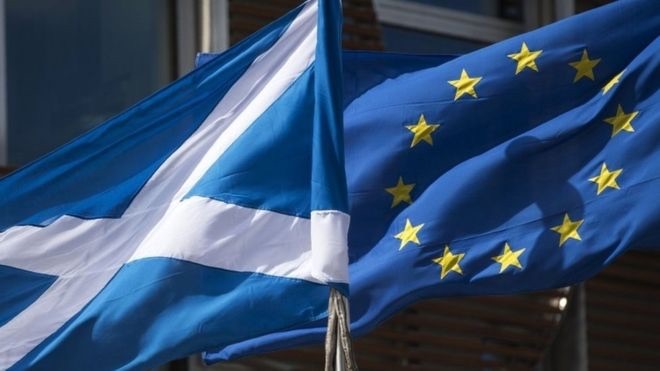 A striking example of this came in the EU chamber last week when Scottish National Party MEP Alyn Smith made an emotional rallying call to the European Parliament. In what he said could be his last ever speech to the European Parliament, Smyth insisted that Scotland remains a European nation and he begged the lawmakers in Strasbourg to leave the door open to Scotland’s return in the event that Nicola Sturgeon and her party can secure a vote for Scotland’s independence from the UK. “We celebrate international solidarity, we celebrate freedom of movement. If the European Union did not exist we would need to invent something like it and Scotland would like to be part of it,” said Smyth to applause in the chamber. “Chers collègues, I’m not asking you to solve our domestic discussions. I am asking you to leave a light on so we can find our way home,” he added. It was a powerful, articulate contribution to a debate that, in Britain, has become more vicious and increasingly half-witted with every passing day. If there were more politicians like Mr Smyth in Westminster then Europe might have been spared this abject mess. The SNP’s fight for Scottish independence still has a long way to go but recent polls have shown that more and more Scots believe Brexit will make Scotland’s independence more likely. Crucially 43 per cent of previously undecided Scots polled in the last week say that Brexit had made up their minds and that they now back independence. Whatever about Westminster, there are interesting times ahead in Holyrood.